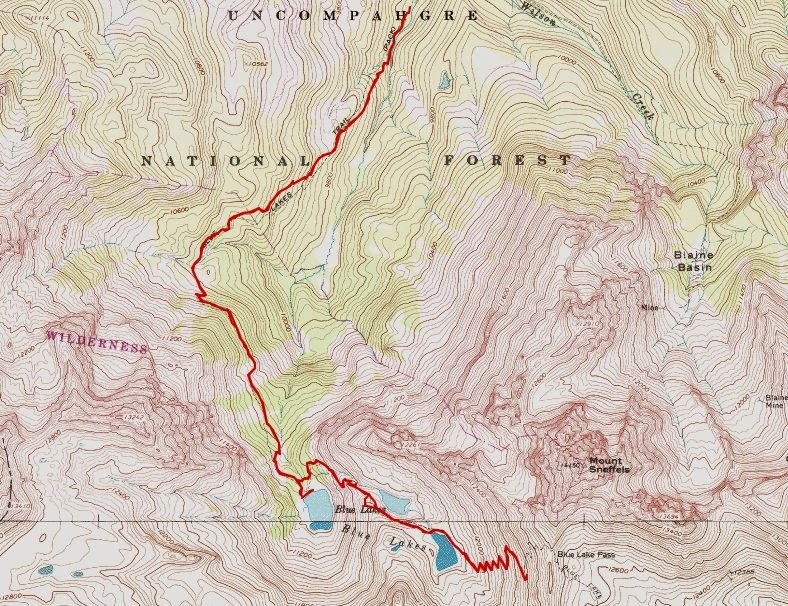 This hike was one of the hikes I had planned for Leesa and I to do while on vacation in the southwest. It was a hike that I had read about with great interest. It offers beautiful blue lakes and high alpine scenery. We arrived in the beautiful town of Ouray, Colorado on 9/4 and camped at the Amphitheater Campground that lies high on the hill just south of town. The town lies at approximately 7800' and is surrounded by 13,000' mountains. To access the Blue Lakes trailhead from Ouray, we drove north to Ridgway, took CR62 to Dallas Creek Road, then followed this gravel road south to the trailhead. For us, the 3.3 mile hike to Lower Blue Lake was a short hike. The only question was whether altitude would be a factor. The trailhead lies at roughly 9300', with Lower Blue Lake up at 11,000'. We had arrived in Denver less than 48 hours earlier, so we hadn't had much time to acclimatize. One thing that we noticed, and have noticed before, is that trails in Colorado and other areas out west generally provide much better footing than trails in the east. Western trails also have many more switchbacks. Perhaps the easier trail terrain would counter balance the altitude. We took it slow and easy to test our eastern lungs, and found that, while noticeable, the thinner air provided no barrier for us climbing at this altitude. The first 1.4 miles of the trail was moderately steep before a noticeable change and the grade flattened substantially. Soon we began to have glimpses of the surrounding mountains. Just prior to reaching Lower Blue Lake, we reached the junction with the trail to Upper Blue Lake and Blue Lake Pass. We continued straight to first take a look at Lower Blue Lake. We passed many fine campsite locations as we approached the lake. Campfires are no longer allowed in this vicinity. Stepping out beyond the campsites, we were rewarded with views of Lower Blue Lake and it's amazing clear medium blue colored water. We never see water of this color in the east. At the lake, we talked with 2 men from Cologne, Germany who were on Holiday. We stayed at the lake to have snacks and admire the lake before deciding to continue to climb to Upper Blue Lake. Look at the clear water at Lower Blue Lake! As we continued to climb, we looked down on Lower Blue Lake from above and it looked even more beautiful. We reached tree-line about halfway to Upper Blue Lake and we were now afforded with 360 degree views. After 4.5 miles and 3 hours of hiking, we reached the beautiful Upper Blue Lake. While not quite the bright blue of the lower lake, it was beautiful in it's own right. Leesa elected to stay at the lake and wander about while sending me onward and upward towards Blue Lake Pass. I had an additional 1300' of climbing to do to reach the pass. The first 700' was climbing along switchbacks in grass and rock. Soon the grass gave way to loose scree. After about 45 minutes of climbing, I was about 300-400' shy of the pass. The trail, while continuing to switchback, was becoming more treacherous and careful foot placement was required. The slope was steep and a misplaced foot could cause a slide. At the same time, afternoon clouds were coming in from the west. While I wanted to reach the pass between Blue Lakes and Yankee Boy Basin, I didn't want to get caught in a famed Colorado afternoon thunderstorm. Rain would make the descent extremely tricky, and besides, I had Leesa waiting for me down below at the Upper Lake. With some sadness, I turned back to head down. Wouldn't you know it, as I headed back down to the lake, the clouds went past and the sun returned. No matter, it was great to be out in such a great spot. I returned to the lake as curious marmots came out to see what I was doing. At the lake, Leesa and I had lunch, then it was time to head back. I couldn't help but snap a bunch more pictures (as you can see below) as we retreated back past the lakes. Eventually we made our way back to the car. It was only 3 PM. We should have stayed at the lakes a while longer. Instead, we returned to Ouray and took pleasure in enjoying the Ouray Hot Springs Pool. There isn't be a better way to relax after hiking! I don't recall that 4wd is needed, but I would check with others. As far as November, I'm not from that area so I,'d check with locals.